The snapper fishery is one of the largest and most valuable coastal fisheries in New Zealand. Snapper spawn in inshore areas and tend to live around reefs and rocky areas up to 200m in depth. They are found most prominently around the North Island (SNA 1 and SNA 8) and the top of the South Island (SNA 7). SNA 1 and SNA 8 encompass the main stocks, accounting for over 90% of the total commercial catch in 2014-15. Snapper are primarily harvested by trawl and longline gear. Most snapper taken in SNA 1 and 8, and some taken in SNA 7, is the declared target species, but some snapper is taken as a bycatch in a variety of inshore trawl and line fisheries. The snapper fishery is the largest recreational fishery in New Zealand, with recreational harvests accounting for over 40% of total catch. Snapper also form important fisheries for customary purposes, but the annual catch is not known. Snapper is managed by the Ministry for Primary Industries using the Quota Management System (QMS). The risk assessment covers over 95% of snapper caught commercially in New Zealand. For more information, download the full risk assessment report. The risk assessment framework is used to assess the relative environmental risks of Australian and New Zealand wild caught fisheries on fish stocks and the aquatic environment. Assessments are undertaken for each species according to multiple ‘units of assessment’ (UoAs). The UoA is a combination of target species/stock and the gear type used by the fishery. Each UoA is assessed against three components for target species, bycatch and ecosystems, and management systems. Each component has a number of performance indicators, which have associated criteria, scoring issues and scoring guideposts. For each UoA, each performance indicator is assigned a risk score according to how well the fishery performs against the scoring guideposts. The summary of risk scores by UoA are presented in the table below. An assessment of the future ‘outlook’ over the short to medium-term (0-3 years) is provided against each component. Outlook scores are provided for information only and do not influence current or future risk scoring. All risk assessments are conducted by an independent third party. The process only takes a few days and includes opportunities for management groups and government to provide input and peer review. The information presented on this page is extracted from the independent species Risk Assessment Report. Component 1 of the risk assessment looks at the health of the population of target species including the current fishing effort and estimates a risk of overfishing. New Zealand snapper are thought to comprise either seven or eight biological stocks based on the location of spawning and nursery grounds; differences in growth rates, age structure and recruitment strength; and the results of tagging studies. These stocks comprise three in SNA 1 (East Northland, Hauraki Gulf and Bay of Plenty), two in SNA 2 (one of which may be associated with the Bay of Plenty stock), two in SNA 7 (Marlborough Sounds and Tasman/Golden Bay) and one in SNA 8. Stock assessments have been conducted for SNA 1, SNA 2, SNA 7 and SNA 8. The 2016 Ministry for Primary Industries Plenary concluded that the stocks were unlikely to be above the target reference points but are not estimated to be below the hard limit (except for SNA 8 which is as likely as not to be below the hard limit). In most instances, it is probably likely that recruitment is not impaired, but the broad range of data, catches and recruitment information result in uncertainty in model estimates. The commercial component of New Zealand’s snapper fisheries is managed as part of the Quota Management System (QMS) which has very strong mechanisms to reduce the exploitation rate where evidence exists that the point of recruitment impairment (PRI) is being reached. There is good evidence to indicate that such mechanisms have been used in other fisheries (e.g. hoki). Moreover, all QMS fisheries are subject to the New Zealand Harvest Strategy Standard which establishes default target, soft limit and hard limit references points which guide the setting of commercial catch limits. Nevertheless, the fishery would be better placed against the scoring guidelines with additional clarity around how exploitation rate will be reduced as the PRI is approached. Component 2 of the risk assessment looks at the risks around bycatch species and other environmental impacts of the fishery. New Zealand’s inshore trawl fisheries are complex, multi-species fisheries, harvesting a wide range of inshore finfish species. The composition of the catch can vary considerably in space and time based on variations in recruitment, changes in market demand and the like. Information on the retained portion of the catch is very strong, reported and verified through the QMS reporting arrangements. For some stocks, this is sufficient to assess the impact of the fishery on main other species with respect to status and detect any increase in risk. However, the available quantitative information is not sufficient in all cases. Information on the discarded portion of the catch is limited. Observer coverage in inshore fisheries has historically been very low (or absent from some sectors), and the main information on overall catch composition comes from independent trawl surveys, which may not be an accurate reflection of commercial catch composition (for example different gear may be used). There is also limited reporting of discards in commercial catch returns. Given the absence of discard information for all sectors, it is not possible to assess impacts and the fishery has been assessed as precautionary high risk. The introduction of electronic monitoring in some sectors may help to better characterise discards. The risks of the snapper fishery to endangered, threatened and protected (ETP) species appear to be largely gear-specific, although there are some regional differences in risk based on the distribution of ETP species. The main potential ETP species interactions in the inshore trawl fisheries are with seabirds and marine mammals. Risks to seabirds associated with New Zealand’s commercial fisheries have been assessed through a hierarchical series of risk assessments. In the most recent assessment, only one species of seabird, black petrel, had a median risk ratio higher than 1 (or upper 95% confidence limit higher than 2). For all other species, current rates of fishing related mortality were not expected to hinder the achievement of management targets (i.e. the risk ratio was <1). The specific contribution of inshore trawl fisheries to black petrel annual potential fatalities is not known, but total estimated captures in trawl fisheries (including deepwater trawl fisheries) represent a small fraction of the overall estimated captures for black petrel. Based on rates of observer coverage, it is estimated that between 400 – 600 seabirds are captured in New Zealand’s inshore trawl fisheries each year. There is also evidence from the most recent risk assessment that risk to black petrel has declined since the introduction of the current National Plan of Action - Seabirds in 2013. Accordingly, the direct effects of the inshore trawl fisheries appear highly unlikely to hinder recovery of ETP seabird species. Bottom longlining accounts for the majority of estimated captures of black petrel across New Zealand commercial fisheries. Of the bottom longline sectors, the snapper targeted fishery accounts for the highest number of estimated captures. Overall, the snapper targeted bottom longlining sector accounted for around 35% of the estimated captures of black petrel in New Zealand fisheries for the three most recent years reported (2012-13 – 2014-15). Although the estimated captures for the snapper bottom longline sector on their own may not exceed a risk ratio of 1, the sector is the largest single contributor to the overall risk score and there is a plausible argument that captures in the sector could be hindering recovery. Between 2002–03 and 2014–15, there were six observed captures of New Zealand fur seals, and no observed captures of New Zealand sea lions, in inshore trawl fisheries. Estimated captures of fur seals in the same period ranged from 40 to 114 annually. New Zealand fur seals are the most common seals in New Zealand and are listed as ‘least concern’, with an increasing population trend. There are no national or international limits on incidental captures of fur seals. Based on this it appears highly likely that current rates of capture are not hindering recovery of either species. With regards to Hector's and Maui dolphin, given the very low median estimates of annual fatalities in the trawl sector, it is unlikely that the trawl fishery will hinder recovery of either species. However, given the preliminary estimates of risk for common dolphins, including the possibility that the risk ratio from commercial fishing may be up to twice their sustainability threshold, and the inshore trawl fishery is considered an important contributor to risk for this species. However, final results from the New Zealand Marine Mammal Risk Assessment are expected in 2017 and future scoring should take these into account. Component 3 of the risk assessment looks at the risks around the management systems of a fishery. The Fisheries Act 1996 and subsequent amendments provide a binding legislative and legal framework for delivering the objectives of Components 1 and 2. Sections 10, 11, and 12 of the Fisheries Act establish the requirements for the decision-making process, and Section 10 further requires the use of best available information for all decisions. The Fisheries Act requirement for best available information leads to scientific evaluation in advance of decisions. The Fisheries Act further requires consultation with such persons or organisations as the Minister considers are representative of those classes of persons having an interest in the stock or the effects of fishing on the aquatic environment in the area concerned including Maori, environmental, commercial, and recreational interests. While objectives broadly consistent with Components 1 and 2 are specified in the Act and Fisheries 2030, and are therefore implicit in the fishery specific management system, it is not clear that explicit short and long-term objectives for inshore trawl fisheries are in place at this stage. Nevertheless, the fishery management system is subject to regular internal review through the fisheries Plenary reporting process and decision making is guided by the Harvest Strategy Standard. The Ministry for Primary Industries implements a comprehensive peer-review process for all science research that is used to inform fisheries management decisions. In addition, the Ministry has a fishery outreach programme of informed and assisted compliance, in which enforcement agents work with the industry in a proactive way to ensure understanding of regulations and to prevent infractions. In combination with at-sea and air surveillance supported by the New Zealand joint forces, vessel activity can be monitored and verified to ensure compliance with regulations and with industry-agreed codes of practice. The SNA 1 stock is as likely as not to be below the soft limit. The most recent assessment of the SNA 8 stock was undertaken in 2005. At that stage, the stock was as likely as not to be below the hard limit, although the stock was projected to rebuild under the current TACC of 1,300 t. An updated stock assessment may result in a lower risk score. The SNA 2 and SNA 7 stocks are unlikely to be below the soft limit, and both stocks are projected to grow under current arrangements. Observer coverage in inshore fisheries has been very low historically, and very limited information is available on composition and volume of discards. The snapper fisheries interact with a number of ETP species. In the bottom longline fishery, the main issue is with black petrels which is the seabird species most at risk from commercial fishing in the most recent risk assessment. In the trawl fisheries, recent risk assessments indicate the extent of estimated captures of seabird species should not hinder recovery, though there is uncertainty over the impact of the fishery on common dolphins. Preliminary results from the New Zealand Marine Mammal Risk Assessment identified common dolphin as the marine mammal species most at risk from commercial fishing. The widespread nature of bottom trawling suggests that fishing is the main anthropogenic disturbance agent to the seabed throughout most of New Zealand’s EEZ. Recent research suggests moderate and high levels of trawling intensity occur in a relatively small proportion of areas shallower than 200m. The capacity of seabed communities to recover from trawling disturbance is not well known. There have been concerns about compliance with quota species retention provisions amongst inshore fisheries. The outlook below provides a qualitative judgement about the likely future performance of the fishery against the relevant risk assessment criteria over the short to medium-term (0-3 years). Assessments are based on the available information for the species and take into account any known management changes. Target species (SNA 1) - Stable: Stock projections suggest the stock will continue to grow slowly at current catch levels, albeit fishing related mortality may still be above maximum sustainable limtis. Nevertheless, a new draft management plan released in 2016 may accelerate progress. Target species (SNA 2) - Improving: Recent catch levels have been lower than estimates of maximum sustainable yield, which should allow for continued stock recovery. Target species (SNA 7) - Improving: Stock projections suggest that spawning biomass is expected to increase over the next 5 years at current catch levels. Target species (SNA 8) - Improving: Albeit dated (2005), the most recent projections suggest the stock should grow towards a sustainable biomass at current catch levels. Bycatch and ecosystems (SNA 1_Trawl) - Improving: The information base to examine the ecosystem impacts of inshore trawling is growing. The introduction of the Integrated Electronic Monitoring and Reporting System (IEMRS) should improve understanding of catch composition and allow more sophisticated assessments of the impact of the fishery on non-target species. Habitat research is ongoing with new studies planned to better understand the dynamics around impact and recovery. Ecosystem modelling is also underway to better understand the trophic impacts of inshore fishing. Bycatch and ecosystems (SNA 2_Trawl, SNA 7_Trawl & SNA 8_Trawl) - Improving: The information base to examine the ecosystem impacts of inshore trawling is growing. 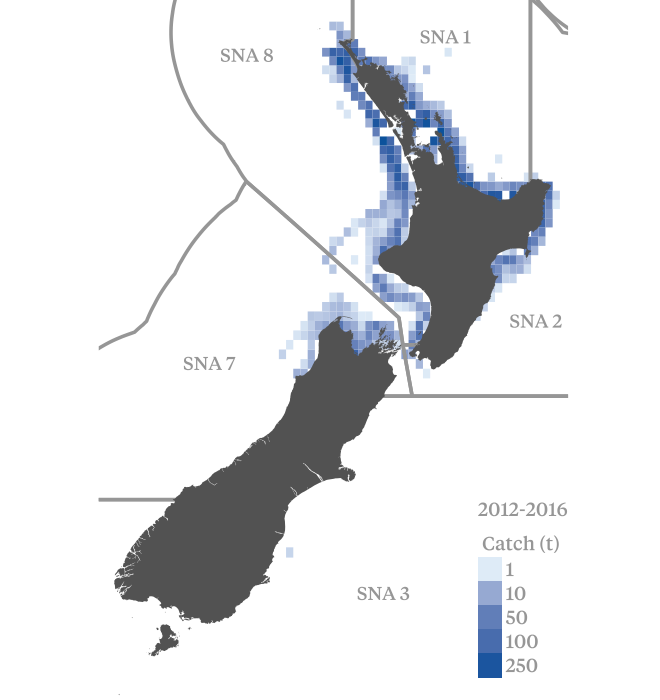 The introduction of electronic monitoring on the SNA 1 fleet should improve understanding of catch composition and allow more sophisticated assessments of the impact of the fishery on non-target species. Habitat research is ongoing with new studies planned to better understand the dynamics around impact and recovery. Ecosystem modelling is also underway to better understand the trophic impacts of inshore fishing. Bycatch and ecosystems (SNA1_LL, SNA2_LL & SNA7_LL) - Improving: Estimates of risk to seabird species have been continuously refined over recent years and have generally resulted in lower estimates of overall risk, including to the highest risk species taken in the snapper bottom longline fishery, black petrel. The introduction of the Integrated Electronic Monitoring and Reporting System (IEMRS) should improve understanding of catch composition and allow more sophisticated assessments of the impact of the fishery on non-target species. Bycatch and ecosystems (SNA1_DS & SNA8_DS) - Improving: The introduction of the Integrated Electronic Monitoring and Reporting System (IEMRS) should improve understanding of catch composition and allow more sophisticated assessments of the impact of the fishery on non-target species. Management systems - Stable: No major changes are expected to management system risk scoring. Please note: The risk assessment is not intended as a definitive assessment of fisheries sustainability. It is not intended to act as a replacement or alternative to formal fisheries ecolabeling programs such as the Marine Stewardship Council (MSC). For more information, download the full Risk Assessment Report or contact us on hello@openseas.org.nz. The factsheet collates relevant information from across the site into a single PDF. The professionally designed format makes it easy to share soft copies and print hard copies.